Trees are wonderful! 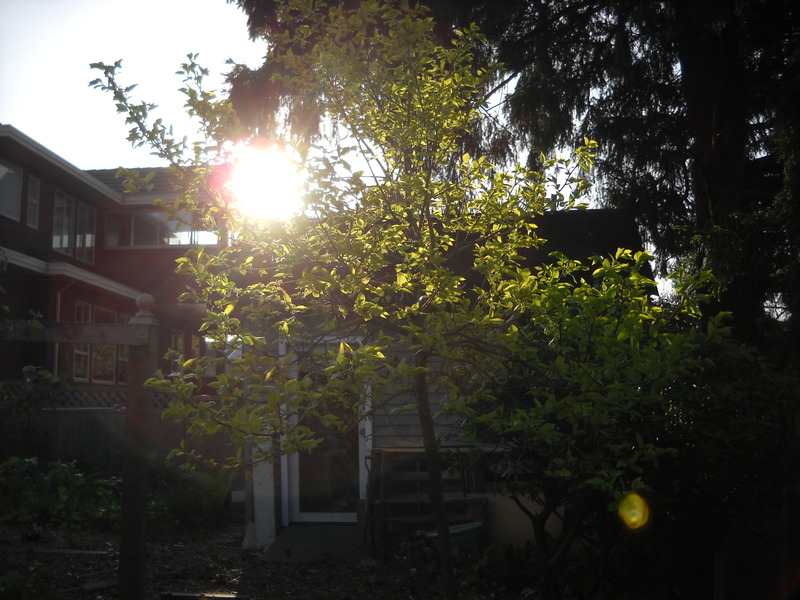 Yes, I know, redundant comment, but truth is, sometimes it’s hard to persuade people to plant a tree in their small urban garden, because they imagine permanent shade, especially in our sun-challenged Wet Coast. Ta-dah! That’s why breeders have focused on developing smaller and narrower cultivars of otherwise giant trees. 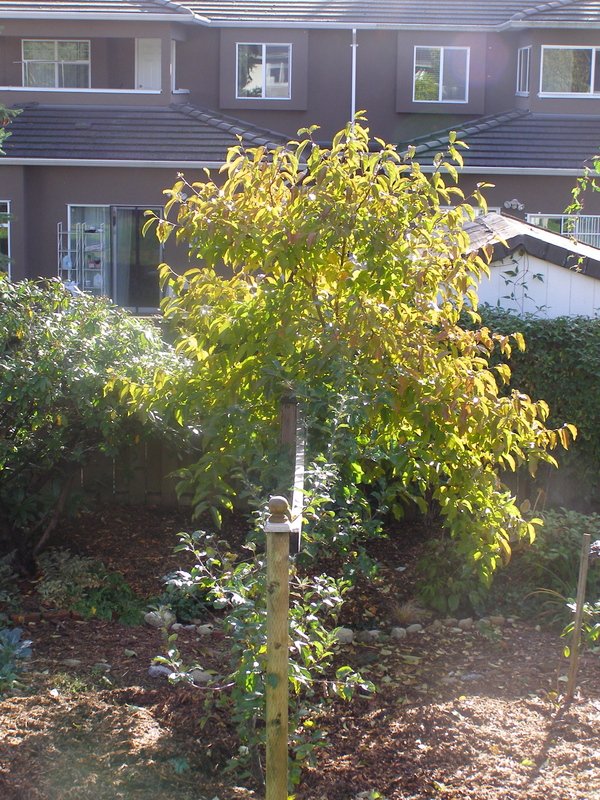 And of course besides new cultivars, there are lots of naturally smaller trees that preform perfectly in city gardens. Which leads me to this pictorial paean to my current favourite, the Fuyu Persimmon (Diospyros kaki ‘Fuyu’). First of all, the habit is very civilized, it grows with a nice rounded canopy. 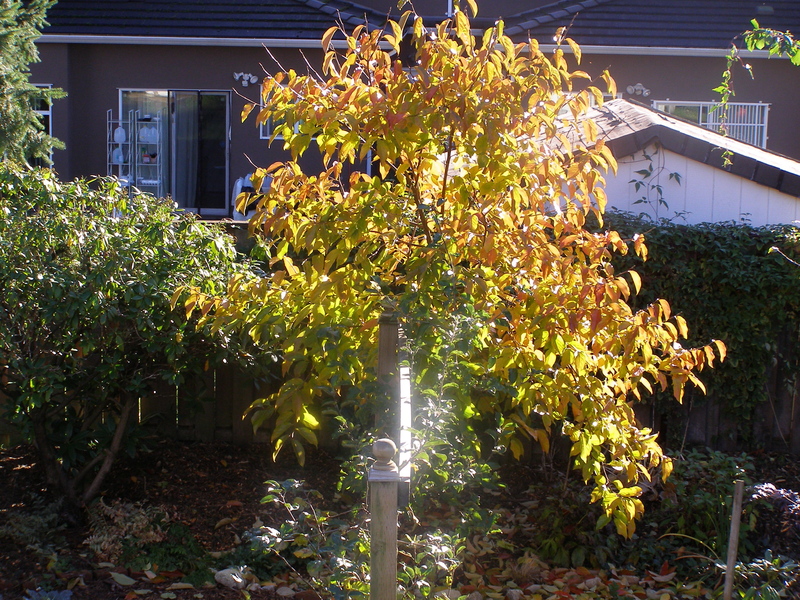 This Persimmon was planted in 2009, it was already a 10′ tree (maybe a three-year-old tree? 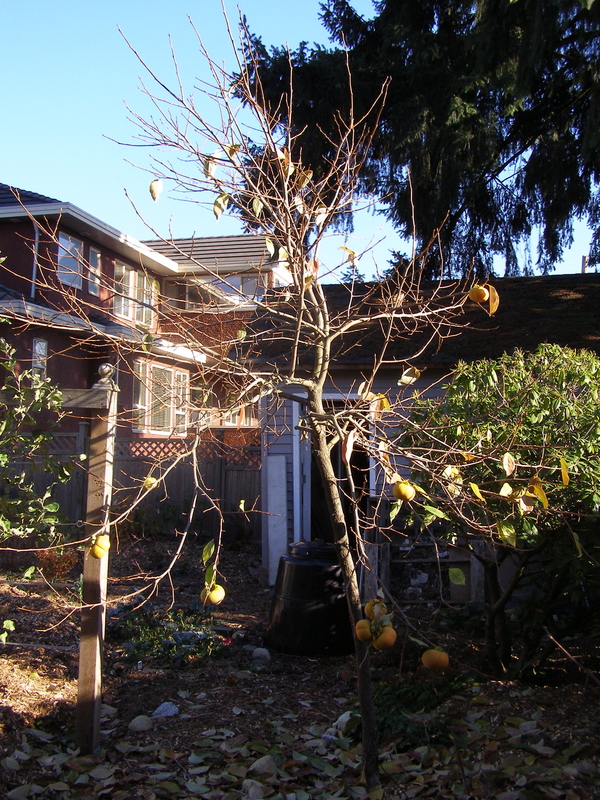 ), and not very beautiful, so I pruned the leader and some of the branches that made it lean over to one side. 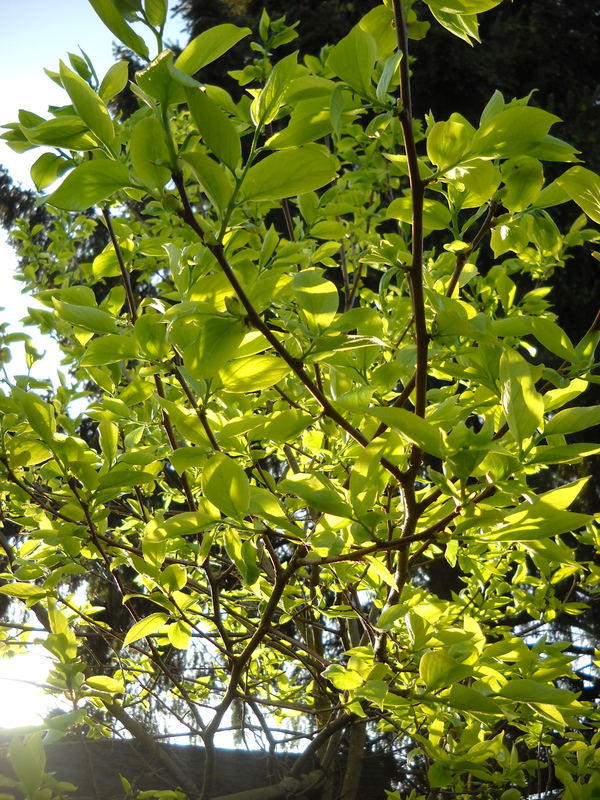 Fabulous chartreuse on dark branches; leaves stay this colour through summer, then gradually darken a bit. One of the best features is its wonderful chartreuse foliage. Not only the colour, but the texture as well–it’s almost leathery, and definitely shiny. 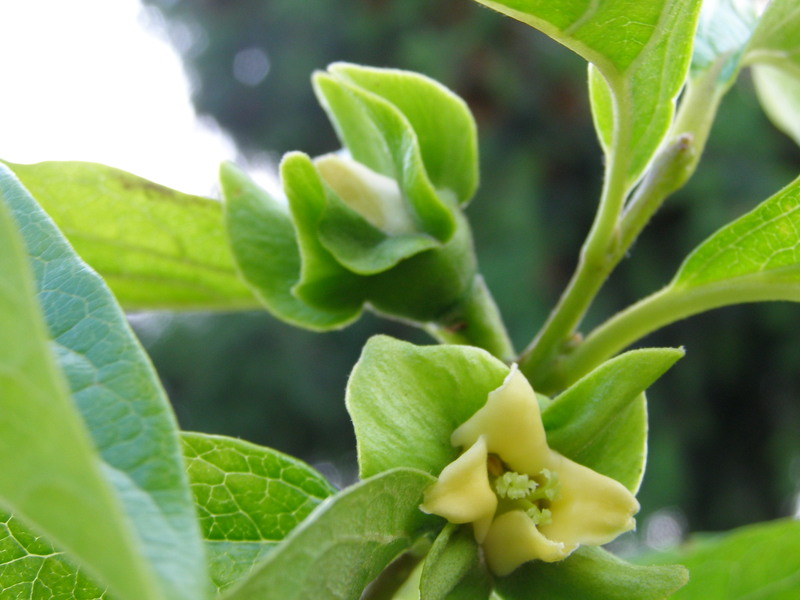 Flower/Fruit calyx. You can see the leaves looking leathery, shiny. The year after planting (2010) I was surprised to see it fruiting already. But alas, no pollination, no fruits. And to my great disappointment, nothing happened –not even blossoms– for the next three years. 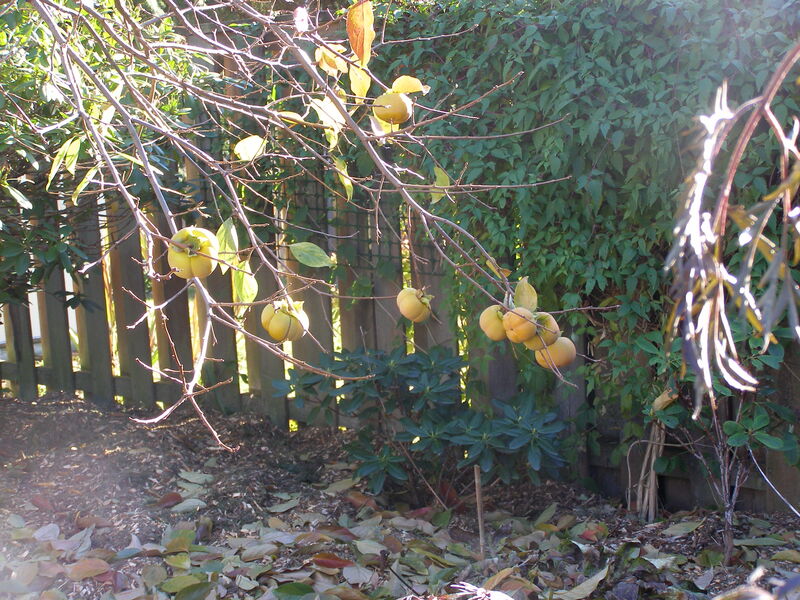 I was encouraged to wait longer since some fruit trees take up to 7 years to fruit, but I didn’t really need persuading since even without fruit, I was beginning to love my little persimmon. Finally this year, having never seen the blossoms, fruits appeared! The leaves stayed green (you can just see them beginning to turn in the picture above) while all the other deciduous trees were losing theirs already, but when she started to turn she did it fast. First week November. You can see the mulch steaming away! Third week November. And can you believe we’ve had over two weeks of frosty sunny weather! But now I can see how many fruits I’ve got. Can you count them? TWELVE! Doesn’t sound like many, but after 5 years of waiting, it’s exciting to me. 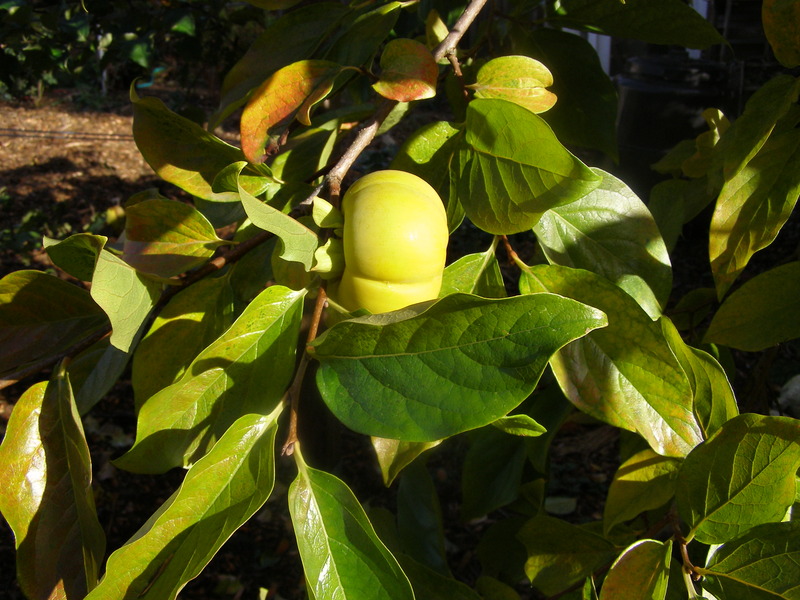 So go ahead and plant an almost care-free Persimmon. If you can find one to buy! Mine came from a little seasonal nursery down the road (only open April to October), while right now, none of the big local suppliers have them on their availability lists. On another note, Fall/Winter is the time to engage your friendly landscape designer so you’re ready to go come Spring. Review the Client Site Analysis page. 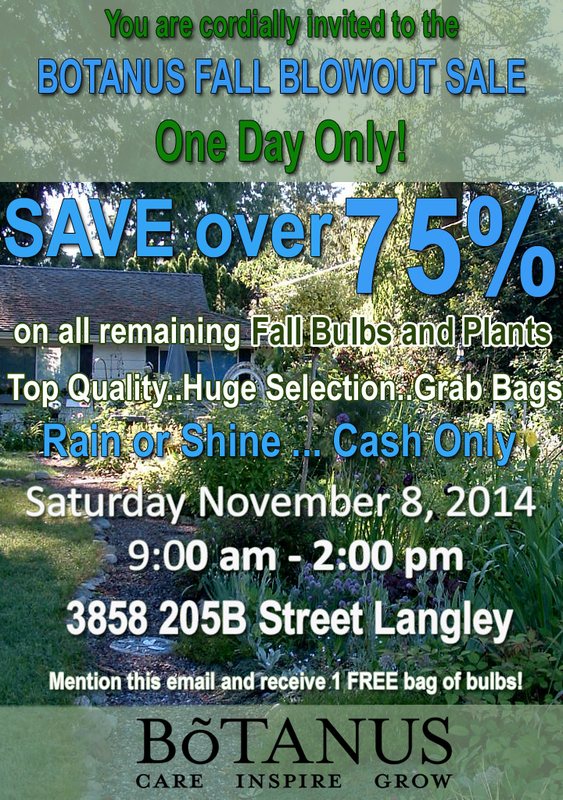 And if you’re in Metro Vancouver, submit the form and I’ll contact you. Oh dear, I fell like RLGS is turning into an Ad Agency. Today I got an e-newsletter from North Coast Gardening about some Kindle books that Amazon has on sale. 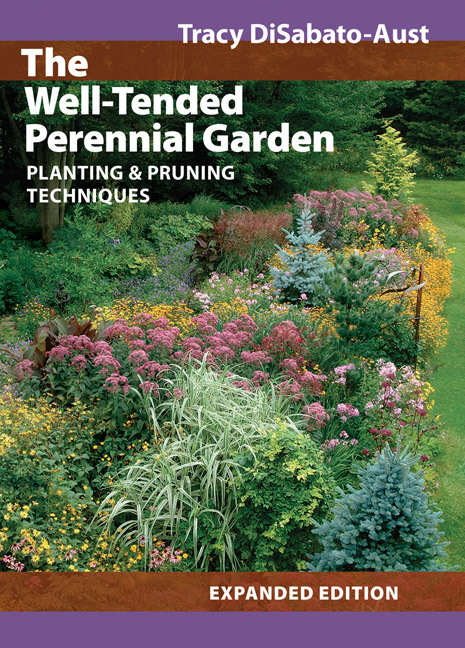 So of course I checked them out, and within a minute I was the proud owner of another Tracy DiSabato-Aust book, “The Well-Tended Perennial Garden”. I already have “The Well-Designed Mixed Garden” and love it, so I highly recommend her books.